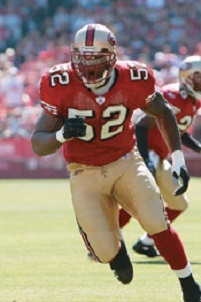 Willis capped an outstanding college career by winning the 2006 Butkus Award as college football’s best linebacker and starred in the Senior Bowl, where he was coached by the 49ers’ staff. San Francisco in turn chose him in the first round of the 2007 NFL draft (11th overall) with the hope that he would be able to compete for a starting job in a rebuilding defense. With his great speed and range, combined with the tutelage of assistant coach Mike Singletary, he became a starting inside linebacker and an immediate star at the position. 49ers went 5-11 to finish third in the NFC West. Willis was credited with another 141 tackles (109 solo, 32 assists) in 2008 and was again selected to the Pro Bowl. From 2009 through 2012 he was a consensus first-team All-NFL as well as Pro Bowl selection each year, even though injuries caused him to miss three games in 2011. By that point, he was a key component of a solid defensive unit and, while his tackles dropped, Willis was more of a factor in pass coverage. Overall, through his first six seasons he had intercepted 7 passes, recorded 17.5 sacks, forced 14 fumbles, and been in on 819 tackles.